Directions: From Austin, take Hwy 71 towards Bastrop, pass HWY 21, Turn right on HWY 20, go about six miles and turn right on Pleasant Chapel Rd. Ranch headquarters will be on your right. $125.00 Bunkhouse rental- The bunkhouse has a full kitchen, dining area, den, toilets, shower, washer/dryer, and beds for ten. Bring your own linens and pillows for the beds. The bunkhouse can be rented by the night, weekend, or weekly. Mileage: Approximately 10-12 miles of trails. 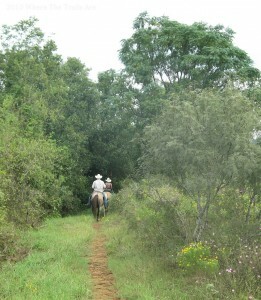 They recently added new trails on the northeast side of the ranch. Terrain: The ground on the southwest side of the ranch is mostly rock free and sandy. The ground on the Northeast side of the ranch is a rocky in spots and has more black dirt than sand. The trails wind through open and wooded spaces. Some trails are full of short up and down gullies and there are a few challenging steep grades. 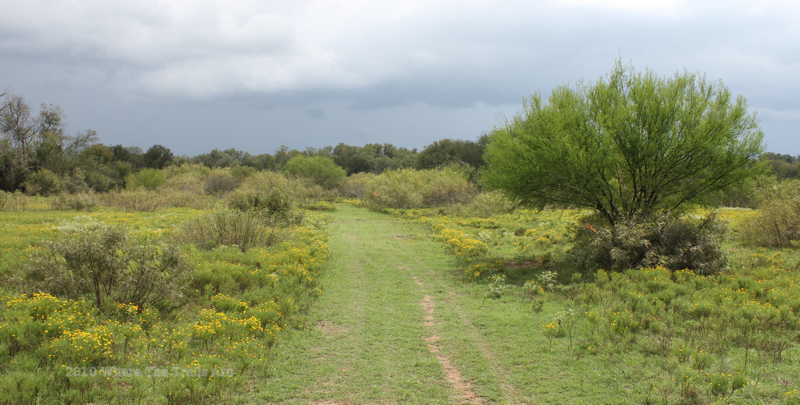 On the southwest side of the ranch trails wind through a 100 year old pecan grove. Facilities: Bunkhouse, restrooms, running water, primitive camping, approximately six hook ups with electricity and water, plenty of parking space, two arenas, pens, paddocks, cafe (call ahead to see if the cafe is open), and pavilion. 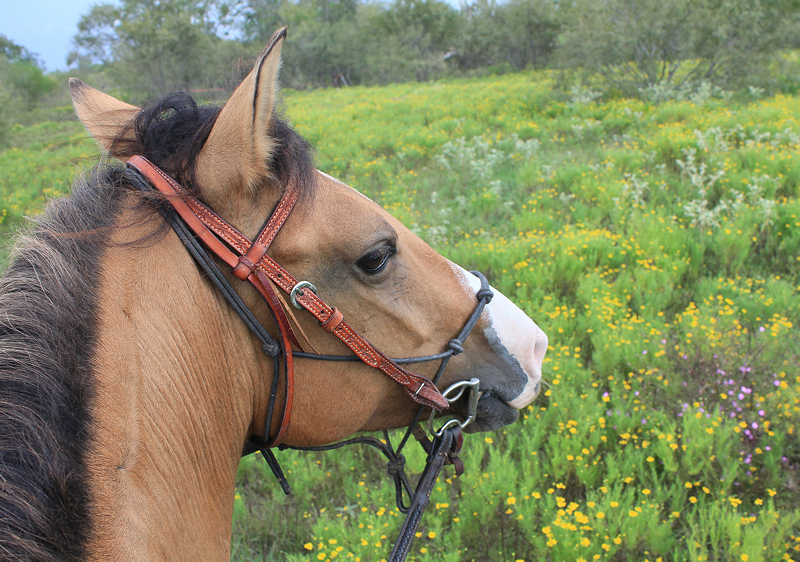 Rusty’s Walnut Creek Ranch offers diverse trails and two good size arenas to ride in. You can camp out at the ranch or even stay over in their Bunkhouse. I visited this ranch for an ACTHA (American Competitive Trail Horse Association) ride and returned to these trails on numerous occasions. The Ranch often has events going on so be sure and check out the calendar on their website. Pleasant Road (Co. Rd 231) divides or goes through the ranch. The facilities are on the Northeast side of the road while the primitive camping is on the southwest side of the road. You can’t miss it as the arena has red pipe fencing and there is a sign which states Walnut Creek Arena. When turning into the ranch running water, the restrooms, and the bunk house are on the left and the large arena is on the right. There are plenty of hitching posts around the ranch, even right in front of the restrooms which is very handy. The pavilion which also contains Walnut Creek Cafe (which is normally only open for organized events) is just a little further back. The cafe is run by Mr. and Mrs. Martinez and their children. It is nice not to have to always pack your own grub when out with your horse. The cheese burger I had was steaming hot and delicious. You can ride in the morning, take a break in the shade while eating at the cafe, and then hit the trails or arena in the late afternoon. Sounds like a good day to me. On this mid September ride the trails were blanketed in yellow and purple wildflowers. I imagine in April and May they are covered in bluebonnets and Indian paintbrushes. 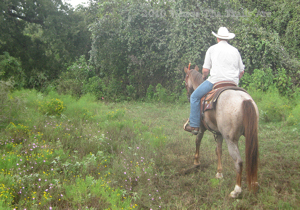 The soft sandy trails on the southwest side of the ranch are easy on the hooves. All trails were well marked with ribbons due to the ACTHA ride, but even without these ribbons it seemed easy to keep a good sense of direction. There are some ponds on the ranch but it was recommended the horses are watered by using the water hoses located by the ranch entrance and the pavilion. Be sure to bring your own bucket. I’m not sure why this recommendation was given, my guess would be that the ponds may get boggy at times. On the southwest side the trails wind through a gorgeous 100 year old pecan grove near the creek providing relief from the piercing Texas summer heat. Since there are cattle on the ranch several trails pass through closed gates providing plenty of opportunities in opening and closing gates while horseback. Be sure and leave the gates as you found them. 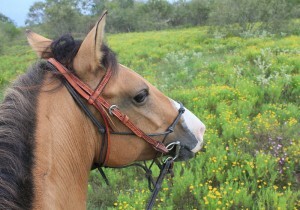 The Ranch is owned by Rusty and Loraine Edwards and has been in Rusty’s family for five generations. 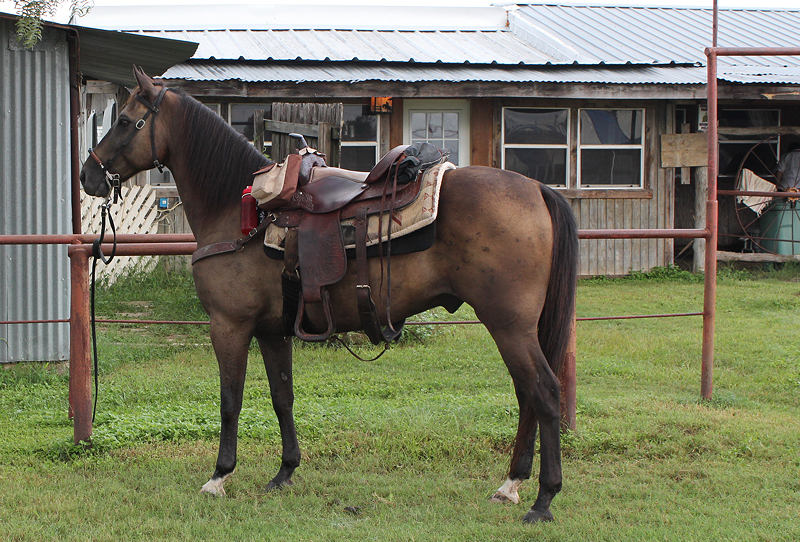 They put on several events such as trail rides, team penning, roping, clinics, and charitable events. Rusty and his family are very inviting and friendly. If you would like to share a review or information about this ranch please see the Submit A Review Tab. Outhouse (to the left) hitching post, the bunkhouse is in the background. 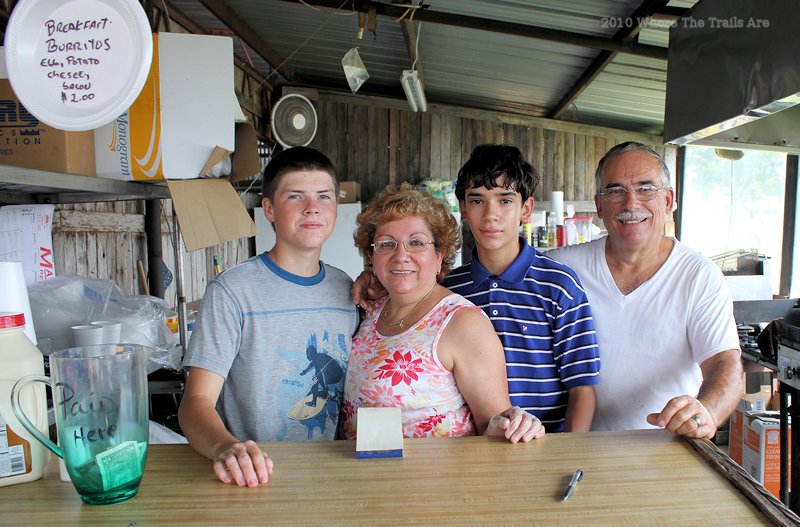 The Hernandez family is working hard serving up good food at the Walnut Creek Cafe. Rain clouds are moving in and Angel is loving the cooler weather.